Game data: James Buchanan Rockets at Greencastle-Antrim Blue Devils ... Friday, 7 p.m. at Kaley Field ... Mid Penn Colonial Division game. Teams: James Buchanan (0-9, 0-6 MPC) remains winless after a 38-0 loss to Waynesboro ... Greencastle (1-8, 1-5 MPC) has lost 5 straight. Notes: After a long, difficult season, Greencastle-Antrim will look to end on a high note against the winless Rockets. On Wednesday, the Mid Penn Conference officially accepted James Buchanan's request to withdraw from its conference football schedule, beginning in 2017, so this will be the Rockets' final Colonial Division game, at least for the foreseeable future. The Rockets are in the midst of a 20-game losing streak and are coming off a game in which they ended up with negative yardage. Zane Bray has become one of JB's most consistent players, and the team's top offensive threat, Cormac Houpt, was injured last week. His status is unknown. For the Blue Devils, they knew it was going to be a rebuilding year, and ending on a win could be just what the doctor ordered. G-A is coming off a 34-0 loss and has managed just 10 points in its last three games. It will hope to get Demetrius Burton going; he leads the team with 702 yards on 125 carries, and last week had 5 catches for 61 yards. Kyrin Zimmerman has caught 7 balls for 117 yards, and Caleb Schaeffer has accounted for 214 yards on 50 carries. Media: Follow @NoahShatzer on Twitter ... A livestream will be available on GameTimePA.com and midpennbroadcasting.com. P.O. pick: G-A by 21. 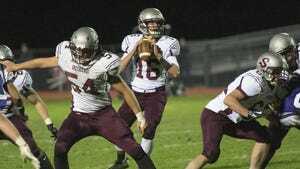 Game data: Mifflin County Huskies at Waynesboro Indians ... Friday, 7 p.m. at Buchanan Auto Park ... Mid Penn Colonial Division game. Teams: Mifflin County (3-6, 3-3 MPC) is coming off a 27-10 win over Big Spring ... The Indians (6-3, 5-1 MPC) have won 5 in a row. Notes: After a strong start in the Colonial Division, Mifflin County is going to have its hands full with the streaking Waynesboro Indians, who are hunting down their first-ever playoff berth. The Huskies defeated Big Spring in Week 9, but lost three straight prior to that. Their offense continues to be fairly well-rounded with 1,036 team rushing yards and 1,432 total passing yards. The receiving game has three major threats in Nathan Bargo (23 catches, 377 yards), Isaac Maclay (30-359) and Malik Secher (14-305). Aaron Smith (50 carries, 355 yards) leads Mifflin County on the ground. But if anyone's offense can keep up, it's Waynesboro's. Brady Beckner is Franklin County's top running back with a total of 1,156 yards on 106 carries. Mason Frampton (42 carries, 283 yards), Forrest Rhyne (44-266) and Dylan Cummins (32-145) have all become nice complements. The Indians also boast a strong quarterback-wide receiver duo in Brady Riddell and Cameron Keck. Waynesboro has a lot to play for as well, as it will need to win in order to keep its playoff hopes alive. Media: Follow @TheRealKReib on Twitter for updates. P.O. pick: Waynesboro by 6.